Yes that’s right – I said it – chocolate chip cookies on crack. When this amazing recipe ran in the Washington Post back in 2009 I thought I had died and gone to heaven. Kim O’Donnell was, I believe, the first food chat on Washingtonpost.com and had a genius way of making accessible food seem fancy and special. I tucked this one away immediately and met my husband-to-be only two months later. I can still remember the first time I made this for him and his BFF – not only did I secure his heart but got his buddies to think I was the. best. girlfriend. ever. Even better? It is stupid easy, you probably have all the ingredients on hand, and its ideal for making ahead of time. Quite simply the best dessert recipe. This was confirmed when my friend Matt asked to come over so I could teach him how to make CCConC- his first time baking and it was a smashing sucess. Any dessert that is so good it gets a single guy to go out and buy ramekins is a winner in my book. Mix flour, baking soda and salt together in a bowl and set aside. 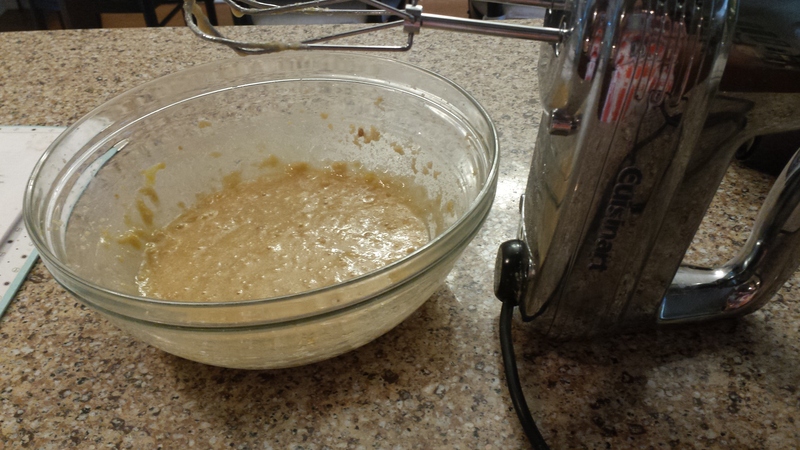 Beat butter and sugars together with a stand mixer with paddle attachment (regular hand mixer is ok as well) on medium speed until well mixed, about 1 minute. Beat in egg and milk until absorbed, then mix in the vanilla. Mixture might look a little chunky but don’t worry. Slow the speed (please do this otherwise you will end up wearing the flour) and add in the flour mixture. 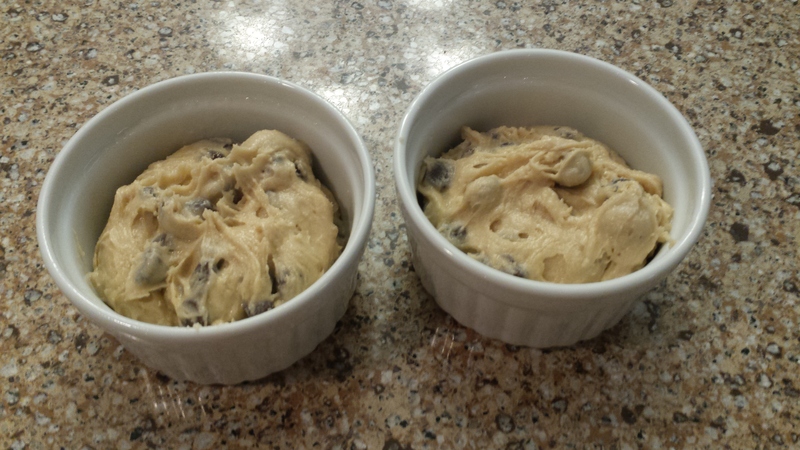 Stir in the chocolate chips and you are done with the dough. From here you can proceed and make the CCConC or scoop into a plastic container and freeze (or store in the fridge for a couple of days). Just defrost in the fridge overnight if you want to serve (or cheat and just take it out before making dinner and leave on the counter). The recipe makes enough for 6 people so pull out as many ramekins as you need. Spray with cooking spray lightly and fill about ½ full. Preheat the oven to 325 degrees and place the ramekins on a cookie sheet (this isn’t necessary but makes life much easier when trying to get them out of the oven). Bake for about 15-20 minutes, more so if the dough is really cold or semi frozen. Basically you want a golden yummy cookie looking top. Do not insert a tester cause it will come out all gooey – and that’s how you want it. This is basically a molten cookie. Let them cool a bit, then top with a scoop of ice cream. 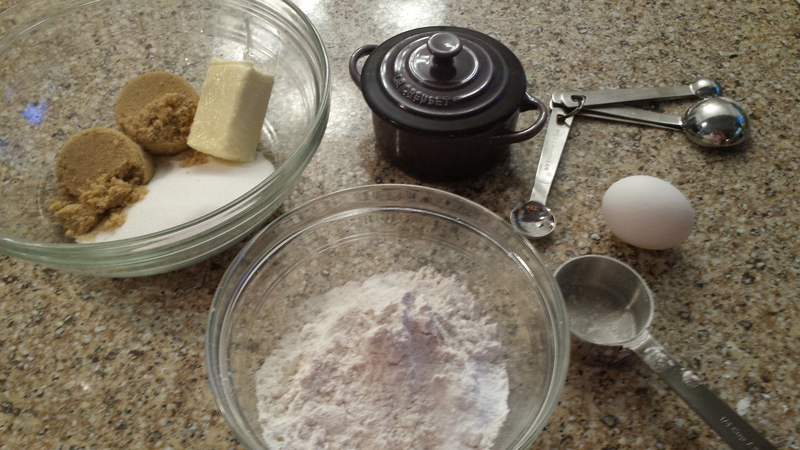 Mix flour, baking soda and salt together in a bowl and set aside. Beat butter and sugars together with a stand mixer with paddle attachment (regular hand mixer is ok as well) on medium speed until well mixed, about 1 minute. Beat in egg and milk until absorbed, then mix in the vanilla. Mixture might look a little chunky but don’t worry. Slow the speed (please do this otherwise you will end up wearing the flour) and add in the flour mixture. Stir in the chocolate chips and you are done with the dough. From here you can proceed and make the CCConC or scoop into a plastic container and freeze. Just defrost in the fridge overnight if you want to serve (or cheat and just take it out before making dinner and leave on the counter). The recipe makes enough for 6 people so pull out as many ramekins as you need. Spray with cooking spray lightly and fill about ½ full (you can also put them in the fridge now and then just cook off later in the night). Preheat the oven to 325 degrees and place the ramekins on a cookie sheet. Bake for about 15-20 minutes, more so if the dough is really cold or semi frozen. 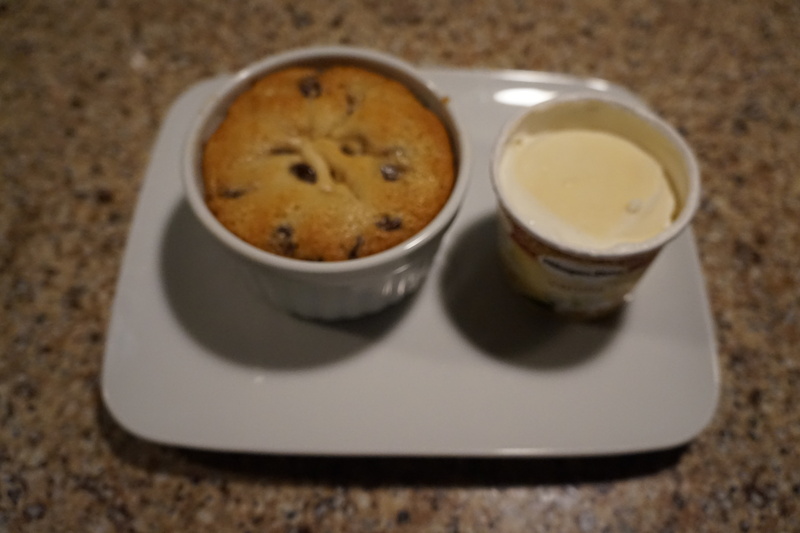 Let them cool a bit, then top with a scoop of ice cream.